Living in a world of convenience, we can rush out to fill most culinary cravings at almost any hour. There are, however, some cravings that cannot be sated at a moment’s notice. You have to wait for them to come to you—and you’d better be ready when they do. Every Saturday morning, in the Olympus Hills Shopping Center parking lot, a trailer full of breakfast delectables arrives. Saturday’s Waffle serves a type of Belgian waffle called a “liege,” in flavors like lemon curd & raspberry, chocolate, Mt. Olympus, bananas Foster, maple bacon, urban lumberjack and the Benny. You can go with the “two topper” and build your own, or stick with a classic and go with plain. Whatever you choose, the experience will be worth the trip. 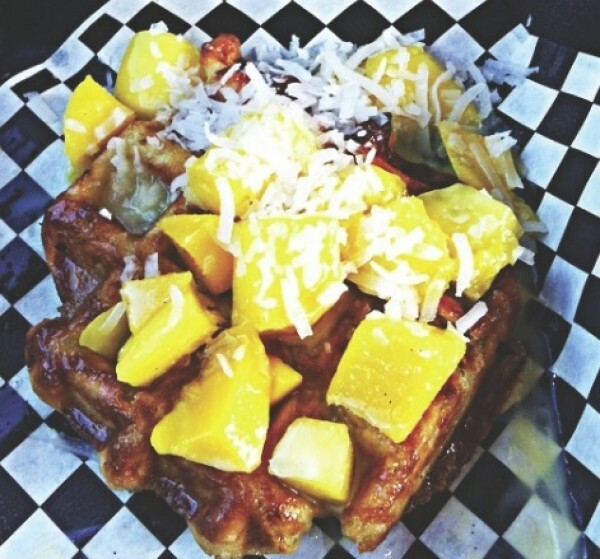 On the morning we arrived, Saturday’s Waffle had Caprese and mad mango on the menu. The Caprese had fresh mozzarella, basil, tomato and a balsamic reduction—yes, on a waffle. The time between being handed our waffles and getting home to eat them was about 10 minutes, and during transport, the balsamic reduction dried, creating a nice crust on the waffle—a marriage of sweet and fresh unlike anything I had ever tasted. The waffle itself had a crispy outside and soft, doughy interior. The basil, tomato and mozzarella made you feel like you were at a farmers market. My only wish was that I had ordered two. The mad mango had large chunks of fresh mango with crÃ¨me anglais and candied coconut. The lemon curd & raspberry had plump raspberries and was drowned in a pool of lemon curd. They were both delicious, could have been served for dessert and just might send you into a sugar coma. Richard, Mike and Colin are the brains and faces behind Saturday’s Waffle. Don’t miss the chance to meet them and enjoy their food.